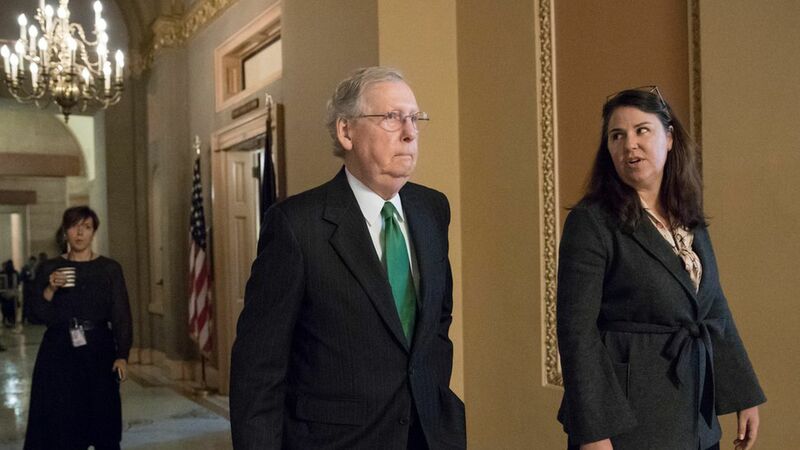 Nine Republican senators have signed a letter to Mitch McConnell calling on him to "turn the Senate on full time, 24/7, to advance the president's agenda." The senators write that "perversion of Senate rules" by Democrats, "designed to imperil" Trump's agenda, necessitates the step. This comes after McConnell told Senate Republicans that he planned to keep them working more Fridays and weekends. It shows the pent up frustration Republicans are feeling after a series of legislative setbacks. It's an inconvenient reality, however, that several GOP senators, including Chuck Grassley and Joni Ernst from Iowa, have been holding up EPA nominees to get their way on biofuels policy. The 115th Congress is being disrupted by sustained, partisan obstruction. We believe our conference must be willing to change how the Senate operates both by tradition and by rule. We appreciate your acknowledging our concerns and applaud your plan to work nights and weekends when necessary to overcome this gridlock. You have our full support to turn the Senate on full time, 24/7, to advance the president's agenda, including a meaningful health care solution, bold changes to our tax code, and funding the government by year's end. As you know, one glaring example of this unprecedented obstruction is the minority party's perversion of Senate rules to undercut the confirmation process of the administration's nominees and judicial appointments. When new presidents are elected, they have always been given an opportunity to put their team in place in short order. Historically, this is not just a common courtesy, it is an expectation of Americans to have a seamless transition of power resulting in a functioning federal government. It is abundantly clear that the tactics employed by the minority are designed to imperil the new administration and its agenda. Overcoming this obstruction will require a real commitment on our part. An aggressive work calendar, as you have proposed, which should include nights and weekends, will enable administration and judicial nominees to be confirmed more quickly. You have our pledge to be available for voting day and night and we offer our time to preside over the Senate when necessary to keep us on track. Given the unprecedented obstruction by our colleagues across the aisle, we hope you will also take a renewed look at the rules governing executive branch nominations. Our conference should always remember that we are fighting for hardworking Americans. In their daily lives, when there is work to be done – whether on assembly lines, in the fields of family farms, fishing in our bountiful waters, or standing in harm's way – everyday Americans do what it takes to get the job done. We owe them the same unrelenting effort in the job they gave us to do.